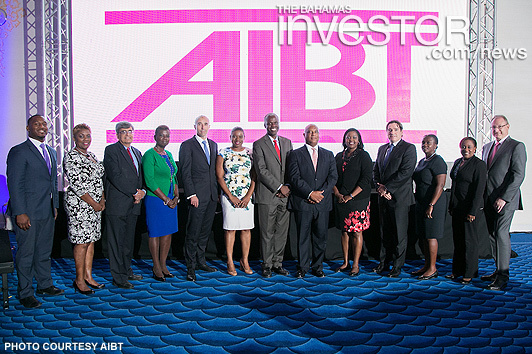 The Association of International Banks and Trust Companies in The Bahamas (AIBT) hosted its third annual AIBT Regulators Forum at the Baha Mar Convention Centre on June 7, 2017. The half-day forum brought together regulators, policymakers and law enforcement leaders with industry professionals to review and discuss the current regulatory and enforcement climate in The Bahamas and the impact of global developments on regulation and oversight. Over 100 industry professionals listened to presentation, and engaged in Q&A sessions. John Rolle, Governor of the Central Bank of The Bahamas and Christina Rolle, executive director of the Securities Commission of The Bahamas (SCB) both spoke a the event. Governor Rolle led off the afternoon with a presentation focusing on recent trends in the sector and shared the Central Bank’s Strategic Plan for 2016-2020. He also discussed policy issues impacting The Bahamas as a jurisdiction and recent efforts around Caribbean-level policy coordination. Rolle of the SCB, provided an overview of international developments in the securities industry and recent Commission policy changes including those related to minimum education requirements for registered persons and the filing of audited financial statements. She also provided a review of legislative developments including recently enacted acts related to the sector. The Regulators Forum, along with the Nassau Conference, form part of AIBT’s mandate to provide professional development and foster growth of the sector. The next Nassau Conference is scheduled for October 4, 2017 under theme “Business Unusual” and the next Regulators Forum in 2018. Jeffrey Beers International has unveiled its restoration of the iconic Dune restaurant at the One&Only Ocean Club in The Bahamas. Read a review of the renovation here.